You may have heard someone who has Alzheimer's disease or another dementia repeatedly call out, "Help me!" or become tearful and cry frequently. Or, perhaps she suddenly has a screaming episode and you don't know how to help her. This can be very distressing to experience, for both the person with dementia and those around her. It can also cause frustration for caregivers when it seems like the person may be crying out for no apparent reason. Crying and calling out in dementia can be triggered by true distress as a result of feelings of loss and being overwhelmed. At other times, crying appears to be less of a sorrowful response and more of habitual behavior. Crying and calling out is sometimes more common in other types of dementia including vascular dementia, frontotemporal dementia, and Lewy body dementia. These behaviors may also increase later in the day due to sundowning, a condition common in dementia where behaviors and emotions escalate toward the evening. Sometimes, someone with dementia may have a period of time when she's screaming out loudly but can't tell you why. She may be feeling anxious or fearful, or be experiencing hallucinations or paranoia. Finally, pseudobulbar affect (also known as PBA) can trigger excessive crying, as well as inappropriate laughter. Those with PBA might begin to cry and not know why they're doing so. There are times when it appears there's no reason for the person with dementia to call out or cry, at least none that you can determine. Sometimes, people seem to "get stuck" in behavior without a reason. Notice any time that the person is not calling out or crying; observe the environment, time of day, if it's after he just ate dinner or just received care, or if it's when he is in his favorite activity. When possible, recreate the situation that occurred when he was content. Assess him for depression and anxiety. 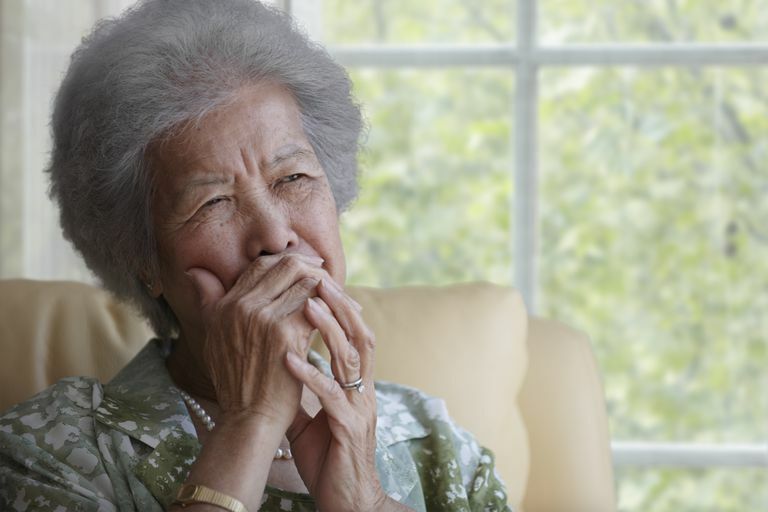 Both calling out and crying can be symptoms of anxiety and depression in dementia. Involve him in meaningful activities. Conduct an assessment to ensure he's not in pain or discomfort. Ask the physician or pharmacist to review his list of medications. Sometimes, a particular medication or combination of medications can cause disorientation and distress. Don't give up. Most of the time, the challenging behaviors that are present in dementia do have meaning, and our job as family members and caregivers is to continue to work to improve the quality of life for people with dementia. Crying and calling out will usually improve with non-drug approaches or medications, or a combination of both. Favorite music: Know what her music of choice is and turn it on for her. This can comfort and distract her. Pet therapy: A warm, fuzzy animal can provide many benefits to those around them. Interaction with children: Young children have a way of engaging the attention of many, including those living with dementia. Snack or drink: Sometimes, a tasty snack or drink can distract and provide comfort. Gentle, reassuring touch: Try holding her hand, rubbing her shoulder or brushing her hair. These touches, which are ones that convey love and concern instead of performing a necessary act such as helping get her dressed for the day, are important to her quality of life. Sometimes, behaviors in dementia are like a challenging puzzle to solve. We don't have the complete answer key to this puzzle, but we do know that often, there are things we can do to help. As caregivers and family members, we should always continue to work to solve the puzzle. Finally, don't forget that sometimes, our own stress may be impacting the person with dementia by increasing their anxiety or stress. Preventing caregiver overload by taking a break for a few minutes is important for the well-being of both you and your loved one.